Charlie found a recipe for these last night, and convinced me that it would be a good idea to make them. We randomly had Oreos in our pantry (that is what I get for bringing Charlie to the grocery store with me! ), and we've been wanting to use our new mixer, so I agreed. Here is the result: chocolate chip cookies stuffed with oreos. Cooking the Oreo with the cookie dough makes it really soft, chewy, and delicious. Please, mom? I'll be so good. If you're going to eat a cookie, you might as well make it a giant one filled with butter, chocolate, and Oreo cream, right? 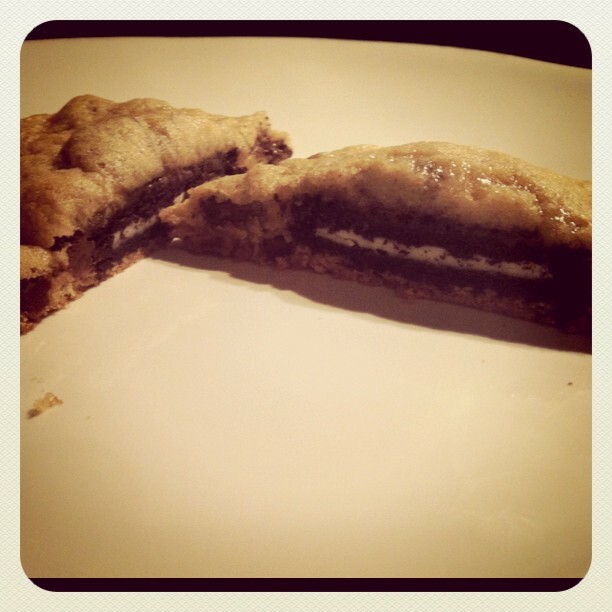 Do yourself a favor and go make these right now! Yummers! Lee and I love choco chip cookies. Combined with Oreo-sounds like HEAVEN! holy yumminess... that sounds heavenly!! !